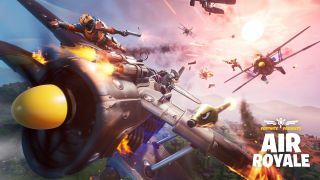 The latest update to Fortnite brought a surprise return of the X-4 Stormwing planes, which have been vaulted since the start of Fortnite Season 8 and were presumed to be pretty decisively removed from the game. It's not a complete return however, as they will only feature in the new Air Royale limited time mode, but that is pretty cool. Initially Duos only, to win this mode you need to stay airborne while shooting down the opposing planes to deplete your enemies' three lives and eliminate them. You can also hijack another team's plane by landing on it and taking control, which will add it to your lives while reducing theirs. Although this mode has just launched, we've got details of all the Fortnite Air Royale Challenges that will be released over the rest of the week, along with the rewards you can unlock by completing them. As well as awarding XP, three of the nine Fortnite Air Royale Challenges will unlock a new wrap you can apply to your weapons and vehicles. For the first one, Callsign Skull, you just have to play seven matches of Air Royale in total, and although the others haven't been confirmed yet, leaks suggest that for Callsign Falcon you'll need to outlast 100 opponents in total and for Callsign Wolf you must place in the top 5 of Air Royale three times. Beat all nine of the Fortnite Air Royale Challenges and the additional Callsign Hornet Wrap will be yours. Most of the Fortnite Air Royale Challenges are pretty straightforward, but here are some handy pointers if you're looking for additional help. As you zip around the island you'll see various coloured glowing orbs in the sky, which you can fly through to collect the Sky Chests which contain either weapons or repair items for your plane. The various colours represent the rarities, so you'll need to collect five different ones for one of the initial challenges. To deal damage to Stormwings with specific weapons, you'll need to collect them from the Sky Chests then hop onto a wing (clicking the right stick to Switch Seat) then fire that weapon at passing planes. Upgraded Stormwing weapons are the ones you collect from Sky Chests and appear as an icon in the bottom right corner, which you should be utilising anyway if you're aiming for a Victory Royale in this mode! Want to try out something different? Then use these Fortnite Creative codes to play the best custom maps available.